jet [which] delivers its thrust in a narrow solid angle (1). I should also mention that this type of astronomical object is thought to originate in the vicinity of a black hole. (1) Meier, David L.; Koide, Shinji; Uchida, Yutaka. Science, Volume 291, Issue 5501, pp. 84-92 (2001). Overcoming Lying Inverse Trigonometric Functions. only if t is between -pi/2 and pi/2. With the above identity my problem was solved. I already know what sin(x) and cos(x) are, so I can use the above formula to find sin(2x). Moral of the story: don’t forget the wonders of trigonometric identities. * The calculations concern the Stokes parameters of polarized radiation. Something I love about physics is how the simple intuition you gain from an introductory physics level discussion of lenz’s law and Faradays law of induction can enable you to understand one of the outstanding problems in theoretical astrophysics: how are large scale celestial magnetic fields generated? 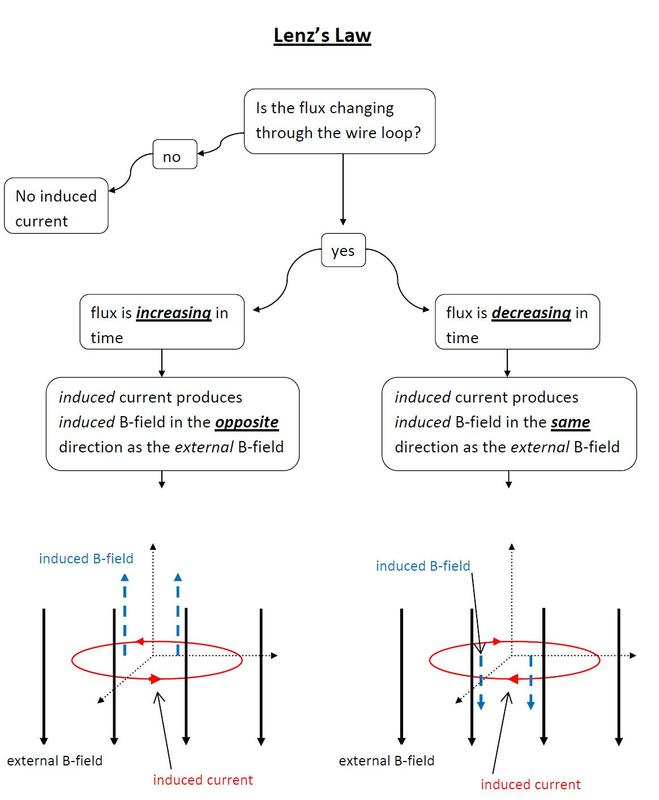 In terms of magnetic fields, Faraday’s law of induction says that any change in the magnetic field through a conducting loop will induce currents in that loop that will oppose such a change in the magnetic field. In other words, changing the magnetic field in an area where currents can flow is hard and therefore takes some time. Alternatively, Faraday’s law says that changing the current in a circuit is hard and takes time. This is because the current itself generates a magnetic field. So, changing the current will change the magnetic field through the loop. So Faraday tells us that there will be an induced current that opposes the original attempt to increase (or decrease) the current. 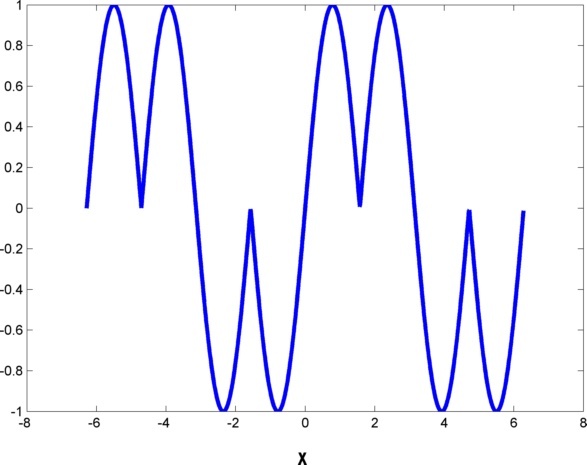 Upshot: changing the current in a loop is hard and therefore takes time. Approximately how long does it take for the magnetic field to go from zero to the equilibrium value, B? For a simple circuit with resistance and some inductance (an RL ciruit) any student of introductory physics could answer this question. where L is a measure of inductance of the circuit and R is the circuit’s resistance. The inductance of a circuit is simply a measure of how much the circuit resists any change in the magnetic field, or by another measure, it is the measure of how difficult it is to change the amount of current flowing in the circuit. In astrophysics, there are similarities to a circuit with resistance and inductance*. The Sun’s magnetic field is about the strength of Earth’s magnetic field, 0.0001 Tesla (where Tesla is the SI unit of magnetic field strength). Further, the Sun is composed of ionized gas and therefore it is very conductive, meaning electric currents can flow easily. Thus we can ask the same question about the Sun that we asked about the circuit: how long does it take for the magnetic field to attain an equilibrium value of 0.0001 Tesla? As it turns out L/R is a good way of estimating this timescale, all we need to do is figure out how to estimate the inductance and the resistance of the Sun. Clearly we’re missing something here, the universe is only 14 billion years old. If the Sun was born with very little magnetic field 5 billion years ago, how did it build up a field of 0.0001 Tesla against induction in that time? According to Faraday’s law and a little plasma physics it takes much longer for such a field to reach its equilibrium value. Another huge problem is that the Sun’s magnetic field reverses every 12 years or so. That means the real time scale for significant changes in the Sun’s magnetic field is a decade, not 5 billion years. The answer to this conundrum lies in a topic that is still very much at the forefront of astrophysics research today: dynamo theory. Dynamo theory is an area of plasma physics that arose because the simple arguments I’ve presented here do not match with observations of the magnetic fields originating from the Sun, Earth, or even the galactic disk. * Check out the pgs 4-5 in Plasma Physics for Astrophysics by Kulsrud (2005) for a similar explanation of the magnetic induction timescale in astrophysics (these pages can be viewed for free using amazon’s “look inside” feature). The most common explanation of the induction timescale (not presented here) comes from the resistive induction equation (on pg 112 of the previous link) when the fluid velocity is zero. ** The -3/2 power of the temperature dependence for the plasma resistivity can seen if it’s recognized that the resistivity is proportional to the plasma collision frequency. It’s also a bit surprising that the resistivity doesn’t depend on the density of particles. The answer is that the more particles the more current, but the more particles the more particle-particle collisions which kill the current. These two effects approximately cancel each other. A more detailed analysis reveals that the resistivity weakly depends on the density (logarithmically) . Usually I do a good job of teaching this strange electricity and magnetism topic, but I recently taught Lenz’s law in the most confusing way possible. Hopefully I can repair a little bit of the damage with this flow chart I made. Here’s a higher quality pdf of the image. As expected, the profiles are roughly gaussian in shape due to line of sight effects analogous to solar limb darkening. 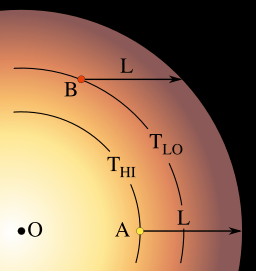 The distance the photons travel through the sun is represented by L in this image. As you can see, the place where the photons are coming from along the edge of the sun (point B) is cooler than the place where the photons are coming from at the sun’s center (point A). Notice that the center of the jet is not as bright as the edges (especially the parts of the jet on the left), thus this jet is limb brightened. So, as usual in science and especially in astronomy, there are exceptions to the rule and we have another astronomical mystery to add to the pile. * There are also some key differences between the limb darkening in the Sun and AGN jets. 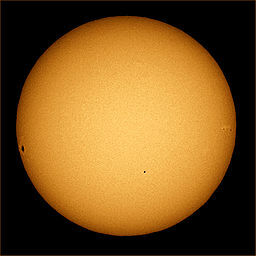 First, solar limb darkening occurs because toward the edges of the Sun your seeing photons that have been emitted from cooler gas than when you look at the center of the Sun. 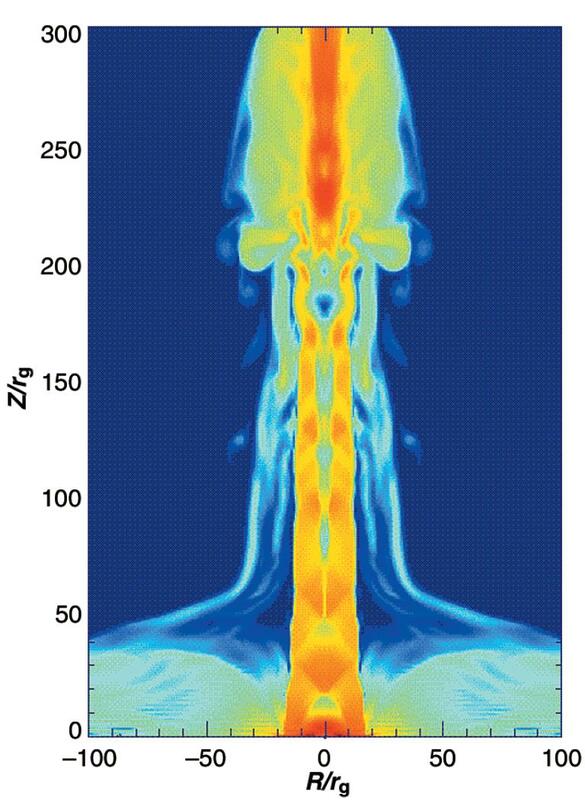 With AGN jets, it’s not clear if the plasma/gas is cooler or hotter in the outer part of the jet. So really the only analogy that AGNs limb darkening has with solar limb darkening is that both phenomena are the result of the curvature of the surface we’re looking at (where the sun is spherical and the jet is roughly cylindrical).